Mixed Martial Arts consists of a blend of the best techniques and strategies from martial arts from around the world including Karate, Kickboxing, Wrestling, Jiu-jitsu, and others. Classes include strength and conditioning drills, target and “bag” work for striking, takedown drills, "cagework", and ground-fighting training. MMA provides an incredible fitness program and a rounded package of martial arts skills. The majority of students who participate in these classes do so for fitness, self-defense skills, stress release, and just for the fun of it! ZenQuest DOES also have a very successful MMA fight team. They are proud to represent the group, and prove that the techniques and strategies taught at ZenQuest WORK when it counts. > TKO at 0:33 of Round 1 via knees on March 12, 2016. Current ZenQuest record for fastest finish. > Round 1 submission (1:47 minutes) via "Mounted Guillotine Choke" against Art "Fists of Fury" Scovens @ 170# on April 24, 2015. > Round 1 submission (1:17 minutes) via "Arm-Triangle" against Andrew Whiting @ 170# on April 11, 2014. > Unanimous Decision against "Nasty" Nate Trough @ 170# on February 1, 2014. > Reality Fighting Lightweight Amateur Title, Round 3 submission at 2:11 via Armbar against Nathan Ghareeb. > Kaged Kombat Lightweight Amateur Title, Round 3 submission at 1:10 via Mounted Strikes against Wyatt Roberts. > Round 1 submission at 1:19 via Triangle Choke against Andrew Lee. > Round 1 submission (2:30 minutes) via "Standing Guillotine Choke" against Matt Woods @ 170# on April 24, 2015. ​> Round 1 submission (0:59 minutes) via "Rear Choke" against Robert Ives @ 155# on April 11, 2014. Other fighters are "cooking" or in the process of training and getting ready for their debut! Keep an eye out for these up and coming champs! These students also compete in a variety of Pankration, Grappling, and Striking events. For more information about joining the ZenQuest competition/ fight team contact us at 413-637-0656. 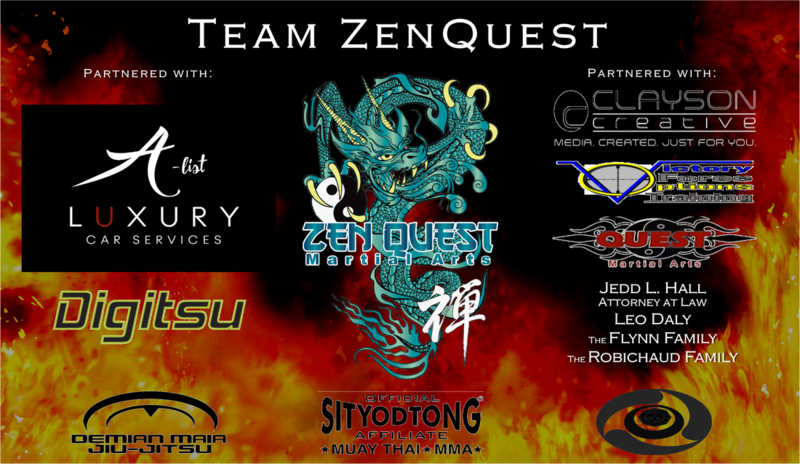 ZenQuest accepts sponsorships and donations in support of the "Team ZenQuest" Fight Team. This support is used to defray expenses like travel, training, meals, team "walkout" shirts, team fight banner, etc. In exchange for their generosity, sponsors are mentioned or displayed on the walkout-shirts, on fight banners, in our monthly newsletter, and on the ZenQuest website. Please contact us for more information about sponsoring the Berkshires' premier fight team...Team ZenQuest!